The Traveller Advancement Level is the first level after Membership in the Scout Advancement Programme, and is all about learning to be a Scout. The Scouts will learn basic knots and lashings, first aid and safety, how to live outdoors, and will be introduced to community service. Orientate a map to north. Explain the difference between True North and Magnetic North. Draw a simple map, using traditional mapping symbols, showing the presence of significant features around your Scout meeting place, home or school for at least 1km. Show 5 points of interest on your map, e.g. police station, fire station, shops, doctors, etc. Be able to direct someone to two places in your community that are at least three kilometres apart. Using a street map, find the shortest route to two points of interest up to five kilometres away. 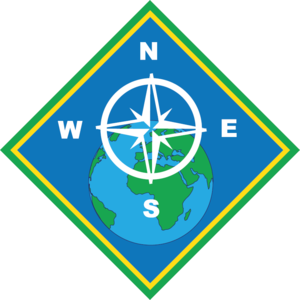 Demonstrate how to find 'north' without a compass, as well as with a compass or improvised compass. Participate in one day or overnight expedition of at least 10km in distance. The expedition can take place on land, or water. Scouts can either walk or use any form of self-propelled transportation. A week after the expedition, give an oral report back to your Patrol Leader (Patrol) or Troop Scouter on what you experienced. Discuss in your patrol OR stage a role-play with another Scout that emphasises the importance and principle of the buddy system. At a simulation staged by your PL or Scouter, know how to approach an emergency scene safely, including the 4 H’s (Hazards, Hello, Help, History) and the importance of your own safety over the safety of the patient. Memorise the main contact numbers for the various emergency services in your area and know how to report an emergency to these services correctly. Discuss various methods of how to draw attention to yourself in an emergency situation where you do not have access to a telephone. Show a basic knowledge of ground-to-air signals. Understand the dangers of fires and how they spread. Describe that you know how to use a fire extinguisher of any sort, and under the correct conditions. Demonstrate how to extinguish a camp or camp kitchen fire correctly using a sand or water fire bucket. Earn the Swimming Scoutcraft Badge. Swim at least 50m in any stroke and keep yourself afloat for 5 minutes using any method as appropriate to your environment. At the discretion of your Scouter, design and make a poster that explains water safety and how to be safe around bodies of water. Explain and demonstrate the components of the Reach, throw, row and go concept of assisting a swimmer in difficulty. As part of a patrol (or by yourself) pitch and strike a tent or other communal shelter. Using natural or recycled materials, build a shelter for yourself, make a bed on the ground and sleep there for one night. Assist in the construction of a Patrol campsite. Lay and light a fire and cook a simple meal from raw ingredients for yourself. Explain the dangers of a fire for cooking and the necessary precautions to prevent an accident. Start a fire with either 1 match or an alternative fire-lighting method (excluding a lighter). Tents, gazebos and other forms of shelter. Gas cooking and lighting equipment or their equivalent. Compasses, maps and other navigational equipment. Any specialised equipment like climbing gear, boats or aircraft. Use a kit list to check and pack your personal kit. While on a camp, maintain personal hygiene and explain the need for it. Be an active member of your Troop's service activities and spend at least 6 hours participating in them. Explain the reason for the Outdoor Code. Obtain the Conservation Scoutcraft Badge. Construct a bird feeder and keep a list of the birds that you see over a period of a week. Clean up litter at your school or other public area agreed upon by your COH or Scouter. Assist at a local animal shelter for 10 hours. Clear alien vegetation from an area agreed upon by your COH or Scouter. Clean part of a waterway as agreed upon by your COH or Scouter. Bring two friends to visit to your Troop meetings or Troop activity. Participate in a Patrol activity where you wear your uniform for an event in a public place. Demonstrate the parts of an axe and/or a bowsaw. Demonstrate how to sharpen an axe or any other blade. Demonstrate the safe use of an axe and/or bowsaw. Know how to care for and store an axe and/or bowsaw. Explain the importance of the correct use and disposal of latex gloves. Demonstrate how to clean and dress a wound. Demonstrate how to control bleeding. Explain the dangers of a dirty wound and the potential risk for HIV and Hepatitis B risk caused by exposure to other people's blood. Keep a record book of Scout events (e.g. camps and hikes) that you have attended. This should include at least 5 entries. Take an active role in the Troop flag ceremony and give the opening and closing prayer or thought of the week. Fulfil the requirements of a basic leadership course (Leadership Development Course 1). Demonstrate your leadership by planning a Patrol day activity including the permit, programme, catering, etc. Explain the use and reason for the Patrol structure in the Scout movement as well as the function of the Group, District and Region (where applicable). Participate in a Patrol in Council meeting. Attend a campfire and participate in a campfire skit. Attend and participate in a Scout's Own ceremony.